I fell in love with Raised Stencils the moment I plastered my very first design in 2001. I love the raised beauty they produce, which mimics designs on the ceilings and walls of high end homes. 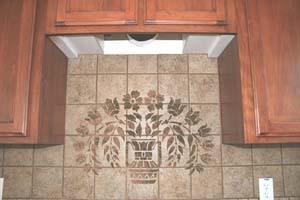 Plaster stenciling can be done on nearly any surface including tile! In this example, I used Wood Icing from woodicing.com with our Raised Plaster Chancelor Frieze Stencil to create a beautiful design behind this stove. Worried about splashes from food? Simply seal with clear, non-yellowing polyurethane to make it easy to clean. Raised stencils are commonly used with plasters, but you can use them with paint too! You will simply find it to be the highest quality, most durable paint stencil you’ve ever used!